10h. Padaria Tartine. This seemingly small from the outside bakery in Chiado opens up to a large, almost an industry size place. Tartine is simply amazing. First of, they are open on Sunday morning. Sounds obvious to many, but trust me, in Lisbon a place which is open before noon on Sunday is a tough call. Then, they have a terrace seating (well, technically speaking, the terrace there is a yard, cozily stashed between the brick walls, but who cares. Open air and some greens are there). And they have a decent free wifi. And, when it comes to that, the food is great, too. We recommend home made granola with berries. 13h. TimeOut Mercado da Ribeira is Lisbon classic. Located close to the city center, the market is full of delights. It is a perfect spot for a summer dinner, as it turned out later, for a very late breakfast, and an improvised soccer fan club during the Euro Cup. We fell prey to multiple recommendations and sticked to Tartar-ia, probably, Ribeira’s most famous place. Tartars were good but not as good as in Paris (in my humble, not biased view). So go around and explore. Literally everything is good there. 17h. We have discovered Bar Entretanto of Hotel do Chiado by sheer coincidence. And it turned out to be one of the best surprises Lisbon had for us. Gorgeous rooftop set up with an open air terrace overlooking the hills with the Sao Jorge Castle, a casually playing DJ, decent wine list and oysters cooked in all possible ways. Hold that thought about the oysters. Limit your Entretanto experience to a few drinks and some tapas in case you are really starving. The highlight of Lisbon food crusade is the dinner. 21h. Cervejaria Ramiro is the place everyone in Lisbon knows. The Uber driver, who witnessed our fruitless attempts to get a place in three other restaurants on our list on Saturday night, was very skeptical when he brought us there. He knew the place, of course. However, he did his utmost to warn us about the waiting time. Very very people, – he said significantly. Very very people it was. The first thing we saw on arrival was a long line. Then the entrance and then the sign. We shrug shoulders, decided to take it as part of the experienced and in a hope that all these people know what they are doing, joined the line. It took us around 45 minutes to get through that line. And well worth this wait was! Ramiro is not the most spectacular place on Earth, it looks more like a canteen (except for the menu on tablets, which does not fit into the overall tavern design). The seafood, however, is among the best I tried in my life (and I tried a lot of seafood, in modest terms). Oysters, lobster, crab, everything was worth a kill (actually, technically speaking, most of this stuff was still alive when we getting seated). Fede, the friend who recommended us this place, specifically told us to try red carabineiros, giant shrimps with some funky cooked juice inside. Based on the shining smile of the waiter when we have managed to convey our wish (and this wish’ pricing), that’s Ramiro’s signature dish. Perhaps, even though our heart stayed with the lobster (and the oysters, for the fairness of recollection on Sophie’s part) and we would have priced the entire thing differently (post MBA side effects). 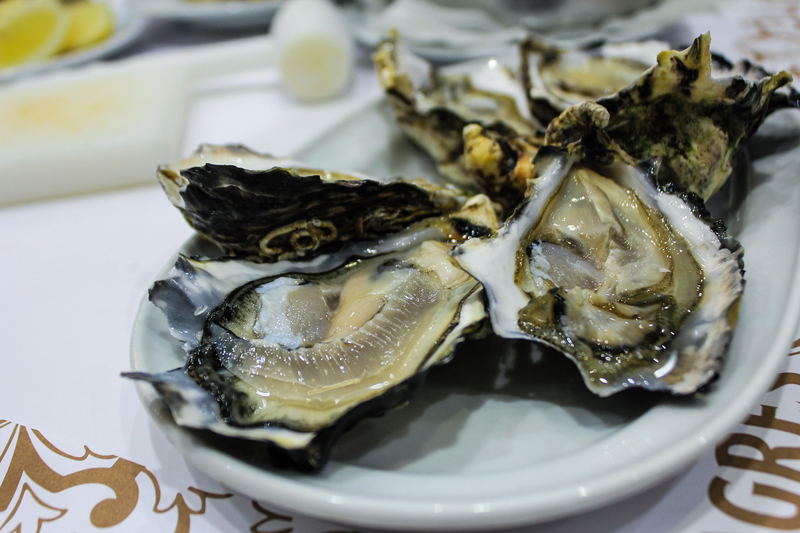 Now you know how to eat in Lisbon like a boss. Bon appetit! The seafood looks amazing!! Now you’ve got me craving lobster and shrimp! Hehe, craving them myself 😀 should never put photos of ice cream, chocolate or cheesecakes! True! That would be pure torture.